Global sales of major arms systems have risen over the past five years to the highest volume since the end of the Cold War, according to the Stockholm International Peace Institute’s (SIPRI) annual report on arms sales. SIPRI, an international institute that researches “conflict, armaments, arms control and disarmament,” said on Monday that more weapons were delivered between 2012 and 2016 than any other five-year period since 1990. Between 2007–2011 and 2012–2016, arms imports by national governments in the Middle East rose by 86 percent. Saudi Arabia, which leads a military intervention in Yemen that has costs hundreds of civilian lives, was the world’s second largest importer after India, increasing its intake by 212 %, mainly from the US and the UK. However, there are some issues with the Guardian’s statement. First, according to the U.N., well over 10,000 civilians have been killed, a staggering difference when compared with the Guardian’s watered down reference to “hundreds of civilians lives.” The vast majority of these civilians have been killed directly by the Saudi-led coalition. Second, the Saudi-led war can hardly be called an intervention considering the brutal and illegal nature of the ongoing operation. The term “war of aggression” is more appropriate. As a result of this cozy Saudi-U.S. relationship, Saudi arms imports have tripled during the war in Yemen. The Obama administration sold the oil-rich kingdom at least $115 billion worth of weapons, as Anti-Media has previously reported. SIPRI’s report concluded that Asia was the main recipient region in the world. India was seen to have dwarfed its rivals, China and Pakistan, by accounting for 13 percent of global imports. Most interesting, however, is that India relies primarily on Russian imports as opposed to NATO countries, further complicating alliances in the region. Together, the United States and Russia have supplied more than half of all exports. 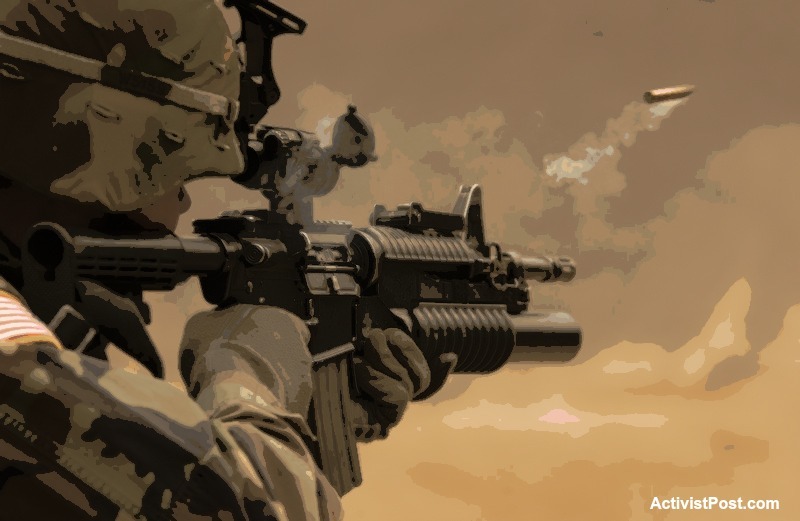 Unsurprisingly, the United States continues to remain the world’s biggest arms dealer. Iran, the country that has been vilified as the world’s biggest sponsor of terrorism and regional aggressor, received a mere 1.2 percent of the region’s arms transfers. Conversely, arms imports into Qatar, alone, have risen by 245 per cent. The report’s damning conclusions reaffirm what many have been warning about for some time now, including former Soviet leader Mikhail Gorbachev: the whole world is preparing for war. ← The Outrageous Hypocrisy of the Neoliberal/”Progressive”! Then my job is done here! I can retire now, knowing the world is safer for the Tube, and the rest of Trump’s cabinet! We of the Trump cabinet are doing everything we can to make OUR world safe. As for YOUR world, look out! Or, as always, American Money Power is pushing the world into war. It’s the only product this totalitarian state has to offer the world.